copyright 2006 Croner. CCH Group Limited. Experimental computer simulation methods are used to demonstrate how a depreciation-type adjustment influences the distributional form of accounting earnings. The results confirm conjectures that earnings distributions generally, with or without depreciation adjustments, tend towards a normal form as a function of increasing 'activity' levels. They also indicate that depreciation is likely to accelerate the transition towards a normal form of activity levels increase and to transform a non-normal form to one that is significantly closer to the normal at relatively low activity levels. The impact of the fixed asset 'impairment' rules is also investigated. 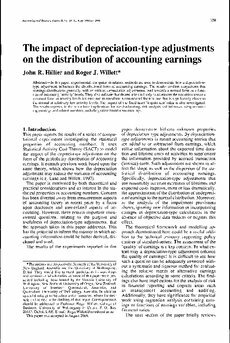 The results reported in the paper have implications for standard-setting, risk analysis and inference using accounting earnings and related numbers, including ratios based upon earnings.